I have three children and out of the three, I have two boys and one girl. My daughter has been tired of doing all of the things that my sons have been doing and asked if she could have a tea party and invite her aunts and grandmas. I decided that we could try it out, but if you've ever thrown a party of any kind, you know that it can get pretty expensive to have one. This time, I decided to try to be more practical about where to purchase the different things for the party. 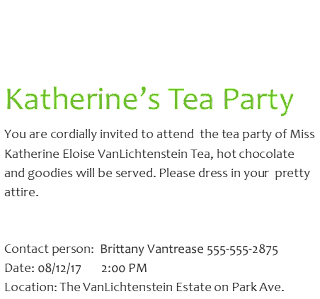 The first thing that I did for my daughter's economical tea party was to create our own invitations. 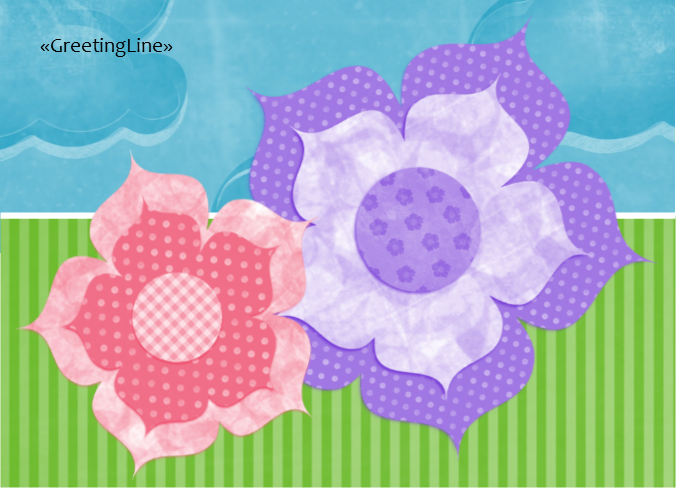 Buying invitations at the store can cost almost $5 or more. By creating my own invitation, I got to be more creative in how it was made and also got to type things out instead of hand writing everything. For this act, I used Microsoft Publisher, but you can make invitations through Word as I figured out when I designed an invitation for the guys to have their own special hang out separate from us. Since my daughter has something new and pretty to wear, I wanted something pretty too. 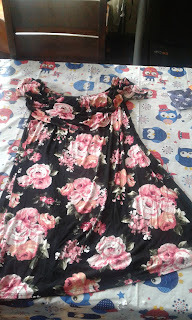 I wasn't able to find a dress at the thrift store, but I did find a dress at Gordman's for $9.99. I don't even think I would have gotten that lucky at Walmart. My next stop was the Dollar Tree. I wanted to find decorations and even some gift bag goodies for the guests. I was able to get all of this for only $21. I don't know if you realize how awesome this is. I always end up spending probably close to $45 or more for my kids birthday parties just for decorations and goodies to send home with the kids. I call this a great find! 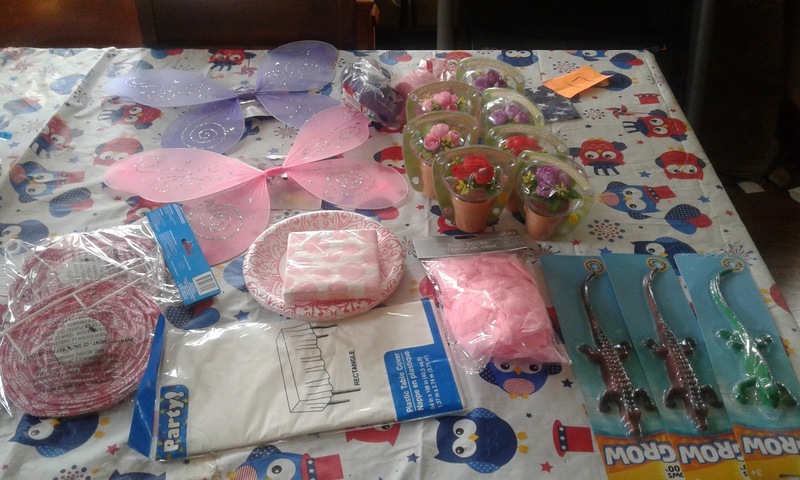 That's 7 mini flower pots with flowers, two pairs of wings- one for my daughter, the other for the dog, paper plates, napkins, table clothe, pink rose petals to sprinkle on top, two lanterns, two different colors of two sets of streamers, and 3 lizard/alligator things for the boys. There was also a blue tutu for the other dog, but it fell off before I could take the picture. The last place I went to was Good Will for some costumed jewelry and cheap centerpieces if I could find them. 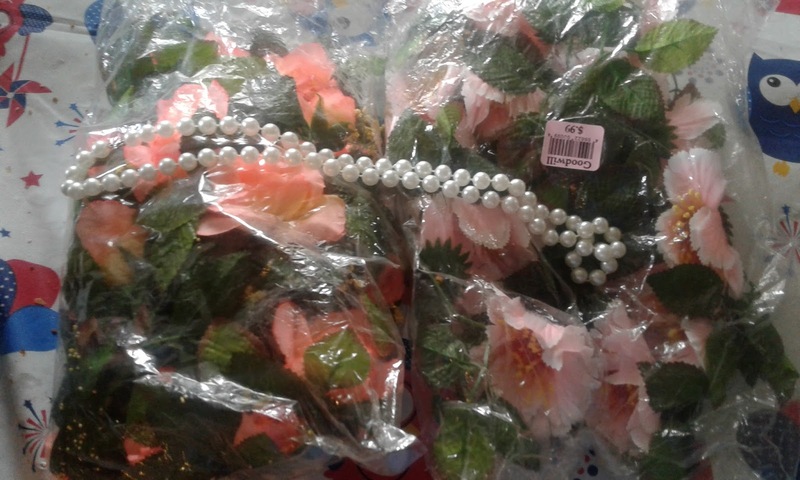 The jewelry wasn't very nice, but I did make off with a strand of pearls and instead of an actual centerpiece, I found some flower garlands that I can get creative with. All of this was for $5. All of this I was able to get for $48. That may seem like an awful lot right now, but if I were to get all of this at Walmart or the party store, you're looking at close to $2 to start out with for each decoration. 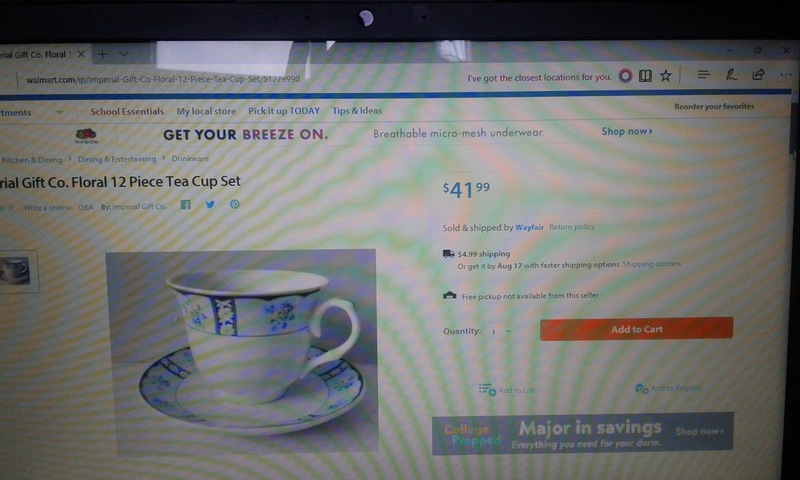 Walmart sells tea cups for $41.99. I got mine, a dress, and a tea pot for $12. While these are all pricey items, sometimes food can be the most costly expense. 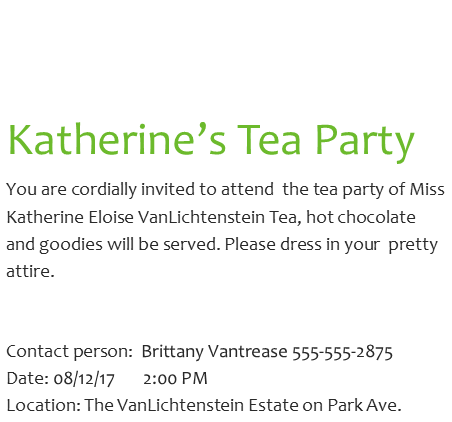 For this party, I am going to be making cupcakes, some cookies, and cucumber sandwiches for the tea party. For the guys hang out, I will be making Salmon Dip and preparing a chip dish. While it will take time to make these food dishes, I already have most of the things in my cupboards to prepare them and cucumbers in the garden. If you can bake you don't have to purchase $12 cupcakes when all you have to do is catch Betty Crocker on a sale and buy a box for $1. I used to be very against thrift store shopping. I never wanted to wear someone else's left overs, but being a stay at home mom, I found ways to challenge myself to get creative with earning a little extra money on the side for pizza money or finding ways to save. Now I almost get a kick out of how much it cost me to buy a barely used outfit for my daughter or sons. There is nothing wrong with buying something brand new, I still like to do that, but if you can save or up for the challenge, why not save a little while getting a lot? What ways have you saved? What was your greatest bargain buy?